Dental implants first became popular during the 1960s. Today, they are regarded as the gold standard of tooth replacement. Dr. Nazarian, our Troy, MI dental implant dentist, often recommends dental implant surgery instead of other common tooth replacementoptions. Some patients might choose a bridge over dental implants because it’s more affordable. The downside is that, since your teeth on either side of the bridge must be modified, you might experience other oral health issues in the future. Bridges also don’t hold up as well as dental implants over time. A properly-placed dental implant, on the other hand, poses no risk to adjacent teeth and will last a lifetime. Implants improve a patient’s bite and can endure normal wear and tear. The initial cost of an implant is offset by what you’ll save on other potential dental issues down the line. Missing laterals, missing bicuspids, and missing canines are common among patients. In these cases, some patients will opt to have their existing teeth moved with orthodontics to fill in the gaps. However, moving teeth for this purpose usually results in an obviously awkward smile. For patients who have reached adulthood, our dental implant dentist will almost always recommend implants as a replacement for missing teeth. A tooth’s root is important to help maintain bone health. When the root is missing or removed, such as when a tooth is extracted, the bone in that area is reabsorbed by the body and can cause a number of oral issues. Dental implants take the place of the missing root, stimulating the jawbone and preventing this deterioration. Sometimes, bone loss can become so extreme due to disease, reabsorption, unsupported denture use, or poor oral health that the lower jaw can easily break. Unfortunately, too many denture wearers don’t discover that their jawbone is deteriorating until it’s already damaged. 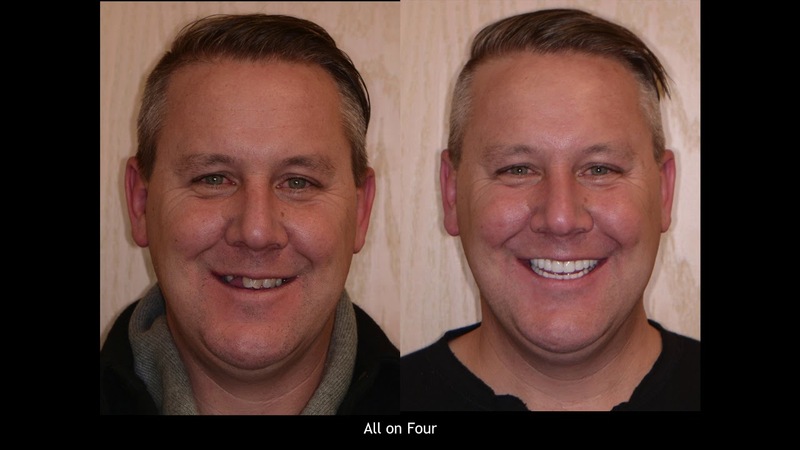 The bone loss progression models pictured here shows, in the left image, a normal complement of teeth and natural lower jaw bone mass and height. Dr. Nazarian uses specialized bone grafting products and implant placement procedures to replace lost bone and to provide sensible anchoring methods for patients who prefer removable prosthetics. For those patients who have been told they are not a candidate for traditional dental implant treatments, Dr. Nazarian can use subperiosteal devices to recreate an entire ridge of new bone that’s necessary for attaching prosthetic teeth. Root canals are a common method of treating abscessed or infected teeth. However, even a successful root canal disturbs the natural nutrient supply of your tooth. Because of this, biting pressure over time can cause the underlying tooth structure to fail. Many dentists, including Dr. Nazarian, will recommend a dental implant instead of root canal treatment. Dental implants are more affordable in the long run, as root canals often need to be retreated down the line and could still ultimately fail. Some patients are concerned that they will have to leave their implant appointment without a full set of teeth. However, in our office many patients can and do receive implants and crowns at the same time. Dr. Nazarian has a variety of methods to ensure that no patient leaves without teeth, even if extensive surgery was required. During your dental implant procedure, we’ll use sedation dentistry to minimize pain. Our office offers IV sedation with a Licensed Anesthesiology RN to ensure your safety and comfort. Patients who opt for IV sedation often find their appointment seems to take no time at all and experience no discomfort during the procedure. Our Troy, MI dental implant dentist wants to take the mystery out of our dental implant procedures. We’re always happy to walk you through your oral surgery process. If you have questions, please fill out our online contact form. To request an appointment with Dr. Nazarian, call Premier Dental Center at (248) 457-0500.